How only a handful of plays on Sunday reshaped the NFL playoff picture. Plus, the rest of the notable news from Week 14. Football! Football!!! The general consensus after an hour of ridiculous finishes to the early-afternoon games on Sunday suggests that we might have witnessed the greatest slate of 1 p.m. ET games in league history, and I’m not opposed to the argument. Getting one game with a late lead change is usually enough; instead, we got the most furious run of scoring the league has likely ever seen as part of a lead-changing scheme in one game, a near-historic lateral play for an almost touchdown in another, and a comeback driven by an onside kick recovery in a third contest. And if that all wasn’t enough, there was a straight-up blizzard for most of one game that made the NFL nervously start Googling “buy cloud-controlling weather machine Amazon Prime” before halftime. It was a great Sunday. What’s really fascinating is how much of what we know and perceive about the NFL can change based upon such a tiny measure. All it takes is one minor decision or one little step to redefine a player’s identity or give a team new life in the playoff hunt. That’s powerful and weird, and the line between those moments going in one direction or the other just isn’t large enough to draw the sort of absolute meaning we take from those calls. So to start today, I want to go through the tiny margins that determined NFL games on Sunday and see what would happen if those slim edges were flipped. Antonio Brown’s foot narrowly stays in bounds: I don’t even know what to say about Pittsburgh’s incredible series of laterals. What are the odds of that play working? Is it one in 500? Think about how many times you see that play per year and how often it ends up with an offensive lineman chucking the ball up for dear life in no particular direction. The solution, apparently, is to throw in a borderline forward pass to try to freeze the defenders into thinking that they can just stop, as Reshad Jones did for a moment on this play. I don’t know if Brown accidentally stepping out of bounds is worse than the Saints actually pulling this play off a decade ago and John Carney promptly missing the subsequent extra point that would have tied the game, but it’s pretty close. So, if Brown manages to keep his foot in bounds and the Steelers win? Oh boy. The Dolphins blow a game at the last second that probably ends their playoff hopes, since it leaves them at 6-7, one game behind the Ravens and tied with a Steelers team that has the tiebreaker. If Joe Philbin gets fired at the end of the year, this is the clip they play as justification, somehow, like he was supposed to prepare his team to be ready for a half-dozen laterals and a Ben Roethlisberger falling-down blind toss. Somewhere, eventually, a writer goes back and reports that Ryan Tannehill can’t win in the cold and uses this game as evidence. OK.
By itself, the real winner from this alternate reality would have actually been Baltimore. Sure, the Steelers would have won, but the Ravens would have been the only 7-6 team in the AFC and had the sixth spot to themselves while holding tiebreakers over the three 6-7 teams: the Dolphins (head-to-head), Steelers (divisional record), and Chargers (conference record). That would be enough to probably push the Ravens into the playoffs, even with their difficult schedule over the final three weeks.1 Instead, strangely, the Steelers actually hurt their archrival the most by losing and leaving Miami in the race. The Wheel of Lead Changes lands last on Minnesota, not Baltimore: Do you want to know how ridiculous and unprecedented those final few minutes were in Baltimore? The Ravens and Vikings traded five touchdowns in a matter of 2:01. The Elias Sports Bureau suggests that the previous record for fastest five touchdowns in one game over the past 50 years was more than 5:30. Go look at the win probability chart for this game. It roughly resembles the heartbeats of Ravens and Vikings fans. Let’s pretend that Cordarrelle Patterson’s 79-yard touchdown scamper sees him wait on the 1-yard line for just long enough to waste enough time to prevent the Ravens from scoring on the ensuing drive.2 If that happens and everything else otherwise stays the same, well, the Dolphins enter the catbird seat in the AFC and Brown becomes the most popular Pittsburgh-drafted wideout in Miami. Miami would move into the sixth spot in the AFC playoffs at 7-6, with Baltimore falling behind them at 6-7 and that tough schedule brewing. Miami also beat San Diego, giving it the tiebreaker there. This one would actually help the Jets, who would then end up as the most likely contender with Miami for the sixth spot. They lost to Miami several weeks ago, but if they beat Miami in their Week 17 rematch and Miami lost one of their other two upcoming divisional games, the Jets could sneak into the playoffs. What, you’re not excited about Geno Smith on the road in the first round of the playoffs? You got excited about Mark Sanchez in the first round of the playoffs a few years ago, right? Is this really that much different? New England doesn’t pull off its first expected onside kick recovery since the 16-bit era: More on this game and the Rob Gronkowski injury further down in today’s column, but the Patriots’ comeback was truly stunning. Well, except for the part where the Patriots got an awful defensive pass interference call to move the ball to the 1-yard line while anybody within 30 miles of the Mass Pike insisted it was a fair makeup call for the Panthers game.3 Pretty fun stuff. Of course, expected onside kicks are successful at about a 10 percent clip, and had this example met its usual fate, the AFC would look a lot clearer right about now. A New England loss on Sunday would have seen the Bengals leap past the Patriots into the second seed in the AFC while holding the tiebreaker over New England and Indianapolis. Instead, the Patriots now sit a game ahead of Cincinnati and a game behind Denver, which would cede the top seed in the AFC to New England with a loss and a Patriots victory. A New England loss to the Browns would have essentially handed the top spot in the AFC to Denver. Now, the Broncos will have to keep hustling. A weather system fails to form and blanket Philadelphia in snow: And then I don’t find out that West Coast transplants from the East Coast secretly wish that the East Coast were just covered in snow so they could feel better about their decision to leave. Just awful. The Eagles would still probably have won their game with the Lions, even without the storm. But it probably wouldn’t have seen LeSean McCoy run for 217 yards against one of the league’s more underrated run defenses. There also might — might — have been more than one extra point attempted. Just a hunch. That loss, combined with Green Bay’s narrow win over Atlanta, opens up the NFC North again. If the Bears pull out a victory over Dallas tonight, it really does become a wide-open race. The combination of a Green Bay win and Detroit loss basically ensures the Packers will take Aaron Rodgers out of mothballs and let him start when he’s cleared to play as opposed to the likelihood that the team would just stick him on injured reserve. So, at the bare minimum, it might swing a few fantasy leagues. The one team that clearly took a permanent step forward on Sunday did so, ironically, while producing a stinker of a performance. The Colts fell behind 21-0 in Cincinnati before eventually losing, 42-28, but Tennessee’s loss to Denver handed the AFC South title to Indianapolis for the first time since 2010. Even the most dedicated Colts fans would have to admit that the Colts haven’t looked good in weeks. What has changed about Indianapolis is a bit of a surprise. And what it means for its playoff hopes might be even more counterintuitive. Indianapolis’s season seemed to take a sharp turn toward the end of its Week 7 victory over the Broncos, when star receiver Reggie Wayne tore his ACL trying to catch an off-target throw from quarterback Andrew Luck. The Colts were able to hold on and win that game, a victory that gave the 5-2 Colts marquee wins over the 49ers, Seahawks, and Broncos heading into a much-needed bye week. They came out of that bye flat and haven’t looked steady since; despite playing a much easier schedule, the Colts have gone 3-3 and have been outscored by a total of 59 points. Some of the difference between those two figures is overstated — the Colts have obviously been able to produce some points in garbage time, as they did against the Bengals this past week — but it’s still pretty clear that the defense is helping drag Indianapolis down to its despairing level of play. And, again, it isn’t like the Colts are playing the league’s marquee offenses during this stretch, either. The Rams scored 38 points against Indy while averaging 21 points against the rest of the league. The Cardinals made it to 40 against the Colts while scoring only 22 points per game elsewhere. 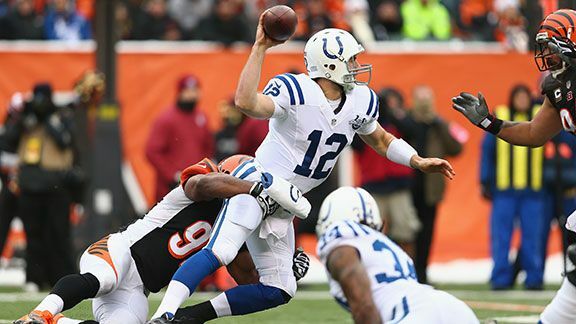 And, on Sunday, the Colts faced a team that had been averaging 24.3 points per game and allowed the Bengals to put 42 points on the board, including touchdowns on five of Cincinnati’s last seven meaningful possessions. What’s missing from that Indianapolis defense? Big plays. The 2013 Colts just don’t have the personnel to be a truly great defense, even with a talented schemer like Chuck Pagano at the helm, but they had been able to create takeaways and get teams off-kilter before the bye. That’s no longer the case. The Colts produced 13 takeaways in their seven games before the bye; since then, they’ve produced just six takeaways in six contests. And it seems weird to say this about a team with a truly great pass-rusher like Robert Mathis, but its rush has been anemic. After sacking quarterbacks once every 12.1 dropbacks before the bye, the Colts have been taking down opposing passers once every 21.9 opportunities. Mathis, incredibly, still has more sacks by himself (15.5) than the rest of the team combined (14.5). And on Sunday, the defense could not have had less of an impact; the Colts didn’t force a turnover against Cincinnati, one of the league’s most turnover-prone teams. Even worse, they failed to sack Andy Dalton even once amid 35 dropbacks. Hell, they failed to even knock Dalton down once. The scary truth about the Indy defense is that there just isn’t much high-upside talent on the roster, and the limited abilities of the guys they do have are being exposed. General manager Ryan Grigson has brought in a lot of middling talent from the outside to try to patch holes on the defensive side over the past two years, and really, it hasn’t done very much. They rely on the likes of Cory Redding and Aubrayo Franklin up front, veterans who are past their prime and only really on the roster because they know Pagano’s scheme. Erik Walden, signed from Green Bay, is a one-dimensional run-stopper who doesn’t execute that very well. LaRon Landry is a flashy player who gets lost in coverages and wanders more often than a veteran should. Vontae Davis has been torched in recent weeks, leading the Colts to take him off top-receiver duties. Two of Grigson’s other offseason signings, lineman Ricky Jean Francois and cornerback Greg Toler, are out with injuries. There are three defensive players on the Indianapolis roster who profile as reliably above-average talents: Mathis, Jerrell Freeman, and Antoine Bethea. The only young player with any pedigree among Indy’s defensive rotations is 2013 first-round pick Bjoern Werner, who has shown little as a situational player across from Mathis, with just a half-sack to show for his first 10 games. And, truthfully, the offense hasn’t been much better. The Richardson saga is well-known and not worth rehashing; coincidentally, he had his best game with the team on Sunday, producing 88 yards from scrimmage on 11 touches. Indianapolis has struggled to account for the absence of Wayne, as opposing defenses have learned to focus their attention on T.Y. Hilton, forcing Luck to beat them elsewhere. Hilton had 14 catches for 251 yards and three touchdowns in the first two games after Indy’s bye, but over its last four contests, his average line has produced four catches for 34 yards. Cincinnati held him to two catches for seven yards on Sunday. The Colts eventually did start moving the ball in the second half, but it came on throws to Da’Rick Rogers and LaVon Brazill. Luck finished with impressive statistics, but his four touchdowns all came with the Colts either well behind or completely out of the contest. OK. If Indy’s defense is awful and the Colts can’t move the ball without Wayne and get blown out by the Rams and have to squeak out wins over the Titans and Texans to win their division, they’re done, right? Let’s call that one a maybe. We’re always quick in sports to reduce teams to the what-have-you-done-for-me-lately argument, when what they did at the beginning of the season might matter as much as what they’ve done recently. It certainly makes sense that the offense might not be able to reach its previous heights without Wayne around, but his absence shouldn’t cause the defense to collapse the way it has. There’s a team that comes to mind here, actually. Think about last year’s Ravens. Like the Colts, they got off to a hot start (albeit a bigger one at 9-2), with most of their wins over tough competition coming at the beginning of the year. They blew out the Bengals in Week 1 and narrowly beat the Patriots in Week 3. When December rolled around, injuries to the defense and a struggling offense produced four losses in five games, but a weak division and one impressive win — a blowout victory that essentially knocked the Giants out of the playoff hunt in Week 16 — were enough to push the Ravens into the playoffs. And when they got there, of course, they looked like a totally different team. That’s not to say that is surely what will happen with the Colts, or that Indianapolis’s poor play over the past six weeks is irrelevant to how it might play in the playoffs. The Colts need to start creating turnovers and harassing passers on defense or they won’t be going anywhere. But the good news is that it’s not too late. Pagano’s team is down, but it’s in. It’s ridiculous to say that an 8-4 team saved its season by picking up a victory at home, but the San Francisco 49ers created a huge amount of breathing room for themselves in terms of the playoff hunt by pulling out a 19-17 victory over the Seahawks at Candlestick on Sunday afternoon. In what is likely to be the team’s final meaningful game at its long-time home,4 the 49ers delivered a physical, exhausting performance against their rivals, culminating with Phil Dawson’s game-winning 22-yard field goal with 31 seconds left. Fittingly, the guy who produced the last memorable big play in Candlestick was one of the players who has been with this team the longest. Frank Gore had averaged a mere 3.4 yards per carry over his previous 100 rushing attempts entering into this game, but those who thought Gore might have lost a step (OK, me) had to be impressed with his burst up the middle on his 51-yard run in the fourth quarter. Backs on the wrong side of 30 with 2,000 carries on their legs shouldn’t be able to freeze All-Pro safeties in their tracks before accelerating past them, but that’s exactly what Gore did to Earl Thomas on the game’s biggest play. And then, several minutes later, there was a moment that echoed one of the greatest games ever played at Candlestick. When the 49ers needed a crucial third-and-7 in the red zone with 3:24 left, both to run valuable time off the clock and set up a (slightly) easier field goal for Dawson, they turned to struggling quarterback Colin Kaepernick, who ran a designed sweep to the left side for a game-killing first down. The run was reminiscent of the stunning sweep by Alex Smith on a critical third down against the Saints in the 2011 NFC divisional round, one that produced an unlikely rushing touchdown. Kaepernick’s sweep here was enough to get the first down, which allowed the 49ers to run the clock down to 31 seconds before kicking the game winner. And even those 2013 numbers are adulterated by Kaepernick’s monster game against the Packers in the opener. Take that game out (unfairly) and Kaepernick’s averaging just more than 7.0 yards per attempt. We’re roughly looking at the difference between Tony Romo’s best season and Andy Dalton’s best season. That’s a downgrade. Kaepernick is a difficult quarterback to judge from a layman’s perspective, because it’s hard to argue that he can’t make the passes or isn’t an accurate thrower. He seems to get choppy inside the pocket in terms of his footwork and is really quick to try to scramble to evade pressure and make a play, which is a natural problem for a player who spent the vast majority of his time in the pistol in college. The 49ers’ offensive line also isn’t playing at the same level it was at a year ago (likely because of injuries), which forces Kaepernick to go through his reads quicker and make smarter decisions on the fly. It’s also true that his receivers haven’t been around, and on Sunday, he got to see Michael Crabtree, Vernon Davis, and Anquan Boldin fly around the field at closer to 100 percent than they have been all year. That’s going to be a huge boon for him going into the playoffs. The other interesting thing about Kaepernick and his numbers is that the 49ers chose not to buy high on him heading into the season, a move they’re not regretting right now. Because Kaepernick was a 2011 draftee who spent his rookie year on the bench, unlike the other Gang of Four members, Kaepernick is already in the third year of his four-year rookie deal. The 49ers will likely begin to approach him regarding an extension this offseason, but what do you base your value of Kaepernick upon? The 2012 model, the guy who slashed through the Packers and threw all over the Ravens during a massive Super Bowl comeback? Or the 2013 version, the guy who seems lost at times amid endless checkdowns to Bruce Miller? He’s a tough player to evaluate and then properly value. Getting more time with Crabtree will help, but Crabtree didn’t have much to offer Sunday, when he had four catches on eight targets for 40 yards. That aforementioned third-down conversion placed the Seahawks between a rock and a hard place; it gave San Francisco a new set of downs and Seattle a tough call. When the 49ers kicked the game-winning field goal, they kicked with 31 seconds left and took a one-point lead. 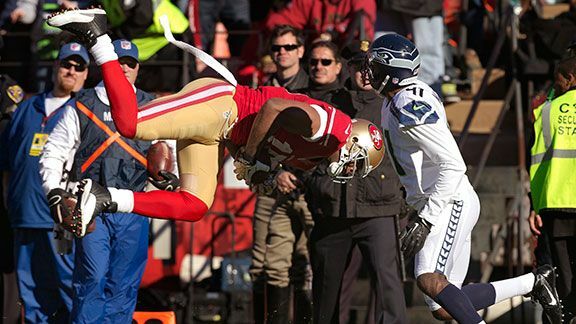 Should the Seahawks have taken the decision out of their hands by allowing the 49ers to score a touchdown several plays earlier? Advanced NFL Stats says yes, and it’s hard to argue with the logic. The field goal as kicked left San Francisco with a win percentage in the low 90s. If Seattle allowed San Francisco to score on the first play after Kaepernick’s conversion, it would have been down six (or more likely either five or seven, pending a two-point play) with the two-minute warning still to come. That seems preferable to a closer game with virtually no time left on the clock, and the numbers suggest it would have left San Francisco with about an 80 percent chance of winning, meaning Seattle would have been clearly correct to give up and allow San Francisco to score. It’s not clear whether the 49ers would have accepted the gift Seattle would be offering in the spirit with which it was intended, but it was likely worth a shot to try to create what would have been a superior situation. The win itself doesn’t open up many new doors for the 49ers, but it allows them to rest a little easier over the final few weeks. San Francisco’s win combined with Carolina’s loss to the Saints leave the two tied at 9-4 in the NFC. That places Carolina as the fifth seed and San Francisco at the 6 because Carolina beat the Niners earlier this year, but it leaves the 49ers one Carolina slip-up away from a possible 5-seed. And with Arizona blowing out the Rams this week, a 49ers loss and a Cardinals win would have left those two tied at 8-5, with San Francisco ahead because of its victory over Arizona in October pending a Week 17 showdown between those two. Now, San Francisco still has a one-game lead over Arizona, and it might go into that Week 17 game knowing it can afford to lose without losing its playoff spot in the process. That’s a huge plus. And if you’re the 49ers, a win over Seattle has to give you a tiny bit of hope. It seems exceedingly likely that somebody will have to beat Seattle in the Pacific Northwest to claim the NFC championship, and you would have forgiven the 49ers for struggling to believe they could win there after two consecutive prime-time blowouts in Seattle. Now, after a complete team performance in a tough game, they have some proof that they can beat Russell Wilson, even if it is at Candlestick. It remains a long shot, but if they can get more out of Kaepernick and possibly see a resurgence from a healthier Crabtree, they just might have a shot. If you’ve managed to escape the clip of Rob Gronkowski’s knee being shattered by T.J. Ward’s helmet during Sunday’s Patriots-Browns game, you should feel like you’ve won something. It’s not a pretty sight. Ward’s hit appears to have created yet another seismic injury for the Patriots, as Gronkowski needed to be carted off the field and did not return; reports suggest that Gronkowski likely has a torn ACL, an injury that would keep him out for the remainder of the 2013 season and raise a lot of questions about his future. First, to be clear: Ward’s hit was not dirty. In fact, the problem with the hit was that it was the only real option he had to make a clean hit whatsoever. The NFL has successfully legislated out of the game the hit up high during plays up the seam, and both quarterbacks and offensive coordinators know that. The pass up the seam to an athletic tight end or a bigger wide receiver is a more popular play than it has ever been before because of that; teams don’t worry about the consequences of laying out their receiver because they know defenders have been told repeatedly to avoid going high. Ward’s timing in making a play on the ball is sound; if he were to go high to try to jar the ball loose, he would have been given a personal foul penalty and fined by the league. If he tries to make an arm tackle, Gronkowski runs right by him. Ward’s only way to make a play there is to try to go low with his tackle. In this case, Gronkowski is vulnerable and laid out, but it’s by a shot to his legs that Gronk can’t protect himself from, not by the traditional shot to the head. I don’t know how you tell Ward that he can’t hit Gronkowski high or low in that situation without basically suggesting that Gronkowski is allowed to waltz into the end zone for a touchdown anytime he catches a seam route. Ward had no intent to injure Gronkowski on the play, and yet the only hit he could really get off was a very dangerous one. There’s no simple solution to that quandary, just the reality that it’s impossible to make professional football with 240-pound athletes a safe game. The long-term effects of this injury for Gronkowski and the Patriots can be catastrophic. At the moment, the specific nature of Gronkowski’s injury is unknown beyond the expectation that he has torn his ACL. If the injury is merely an ACL tear, that would actually be good news for the Patriots. 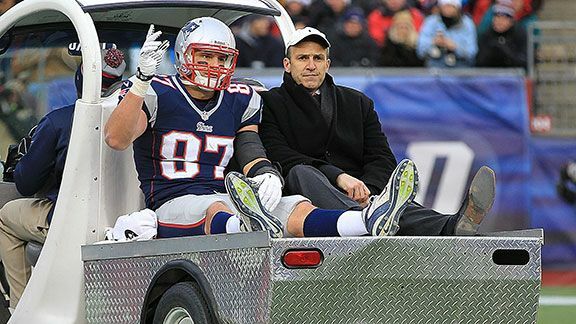 A clean ACL tear and a typical recovery period could have Gronkowski back on the field in time for the beginning of the 2014 season, but there are so many complicating factors to get through first. A more serious knee injury would involve other ligaments in the knee being torn or possible damage to the patella, which adds time and complexity to the surgery and rehabilitation process. And, of course, it’s hard not to think about Gronkowski having surgery without remembering that he ended up requiring four operations on the far-less-serious forearm injury he suffered a year ago as a result of repeated infections. This will be an extremely difficult injury to deal with. It’s also the injury, I think, that permanently changes the way the Patriots view Gronkowski. From this point forward, the Patriots can no longer depend on Gronkowski to be a player they expect to have around for any length of time. They can’t build an offensive scheme or a long-term game plan around a healthy Gronkowski, because the odds of him staying that way are just too low to make planning around him a logical choice. I would be shocked if the Patriots didn’t acquire a tight end in the offseason who they expect to use as their starter going forward, with Gronkowski mixed in as a weapon only if and when he’s ready. I don’t say that to knock Gronkowski; he’s one of my favorite players in the league to watch, and there’s nothing suggesting he isn’t a tough, committed player. As Will Carroll is fond of saying, health is a skill. Gronkowski is an incredible athlete, but we’ve known for years that Gronkowski’s body was a ticking time bomb. I detailed Gronkowski’s medical history in May, but in short, Gronkowski entered the league after missing his entire junior season with a back injury and then fell to the second round because he didn’t appear to be 100 percent. He signed a below-market contract extension that guaranteed him $13.2 million after his second season in the league, almost surely because of the risk that he wouldn’t make it to the end of his four-year rookie contract with major health concerns. Had he not signed the extension, Gronkowski would be in the final year of his rookie deal right now, facing free agency with a terrifying injury history. It hasn’t been one specific problem, but it’s already been his ankle, and then his forearm, and now the knee, with an undisclosed back surgery thrown in for good measure. Gronkowski’s entire pro career has been a race against the injury clock, and that race is probably closer to ending than it is to beginning. The Patriots obviously can’t replace Gronkowski with a similar talent, let alone in the middle of this season; there’s just not anybody like him out there besides maybe Jimmy Graham. In the short term, they’ll likely change their personnel sets and go three- and four-wide more frequently, as Field Yates suggests in this ESPN Insider piece. They likely won’t use a two–tight end set very frequently outside of short-yardage situations, since their top two tight ends are now Michael Hoomanawanui and Matthew Mulligan. It wouldn’t be a surprise to see them split Shane Vereen out more frequently and use him as their primary receiving option. Their red zone offense will go back to the dismal waste of time that it looked like before Gronkowski returned. Oh, and the days of benching Stevan Ridley will be over; the Patriots can’t afford to leave anybody on the bench anymore just because they might fumble. It’s all-hands-on-deck time for the Patriots. It seems superfluous that the Patriots actually came back and won this game. It was their third stunning win of the year, after a seemingly lost game against the Saints and the epic comeback win over the Broncos two Sundays ago. It’s hard for me to believe this is some kind of Patriots trend, since the circumstances are so different and the repeatability of those wins is so impossibly low. New England is now 7-3 in games decided by one touchdown or less this year, and its “luck” in those games is the difference between the Patriots being 10-3 and a more plausible 8-5. In any case, the wins they’ve booked aren’t going anywhere, and they have placed themselves into a pretty comfortable spot in the AFC. That said, the Patriots will have to battle through the absence of yet another key player. They’ve now lost Gronkowski, Sebastian Vollmer, Vince Wilfork, and Jerod Mayo to season-ending injuries, arguably four of the team’s top seven players. That doesn’t include the absence of Aaron Hernandez, either. They will survive the absence of Gronkowski. Thriving in the way that seemed possible with Gronk in the lineup might be another story altogether. The Ravens finish the season at Detroit, against New England, and at Cincinnati. If we ended it after the Toby Gerhart touchdown instead, the local Vegas Man who had under 42.5 on this matchup sees it end 19-15 and doesn’t have to cry for the next month about suffering one of the most unlikely losses of his gambling career. There has to be at least one season-ticket holder who managed to leave Gillette Stadium before all three Patriots comebacks this year, right? The King of Route 1? The 49ers are moving out of Candlestick before next season, and their only remaining scheduled home game comes against lowly Atlanta in two weeks. Unless they somehow win the NFC West, which would require them to win out and Seattle to lose out, they’ll be a wild-card team in the playoffs, which would net them a home game only if they were the fifth seed and they faced the sixth seed in the NFC Championship Game.